Following the news that he has been named the EFL League Two Supporter of the Year, we throught it would be a good time to republish an interview we did with the Cobblers historian Frank Grande earlier this year. And in one sentence, Frank Grande manages to sum up his love for Northampton Town Football Club, and his favourite player to have donned the claret and white in 60 years of watching. 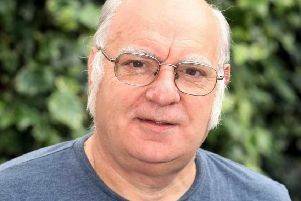 Grande has been the club historian for the Cobblers since the early 1980s, being the go-to man for facts and stats on Cobblers players from the earliest days following the club’s formation in 1897, right through to the present. He has written and published a string of books on the club, including a history and a who’s who, and there is another on the way detailing the career of one of the club’s most famous sons, former player, manager, secretary and director Dave Bowen. The 70-year-old will soon be filing away his stats books and files after more than 35 years of service, although things will be kept in the family as he is to be succeeded by his grandson Ethan - but more on that later. It seems the right time to talk to a man who may not have ever set foot on the pitch at either the County Ground or Sixfields, but has been part of the fabric of the club for so long. So first things first, when did Frank first watch the team who he would follow for the rest of his life? “It was October, 1958, and it was a 1-1 draw with Exeter City,” said Frank, who was aged 10 on that first trip. “It was at the old County Ground, and I don’t really remember too much about it. “I just remember thinking I had never seen so many people in one place at one time! I fell in love with the club straight away, and I always was in love with the club. As timings go, becoming a Cobblers fan in the late 1950s was pretty perfect, with the club on the cusp of launching the amazing run through the Football League divisions, culminating in that one and only season in the top flight in 1965/66. “I followed the club up to the first division, and saw most of the home games in that season,” remembered Frank, who was born in Wellingborough and taken to games as a youngster by a family friend, as his dad ‘wasn’t interested’ in football. Indeed fans of Frank’s vintage did, in both the Cobblers team and in those of the opposition, but who is the best Cobblers player he has ever seen? “I have to say it was Frank Large,” said Frank, who was also a familiar face on the local parks footballing scene, enjoying stints as the Sunday Alliance League secretary, a referee assessor and an NTFA official. A total of 60 years in the tank watching one football club means there are a lot of games stored away in the memory bank as well, so what matches are Frank’s top picks? “My favourite game was the 8-2 defeat to Manchester United, with George Best scoring six,” he said, referring to the infamous FA Cup clash of 1970 which although ended in that heavy defeat for Town, saw one of the world’s greatest footballers strut his stuff at the County Ground. Great memories all, but how did Frank come to be the club historian in the first place? Well, that was all down to his love of compiling a stat or two - and another man’s dislike of the same thing! “When we played Aston Villa in the FA Cup in 1983, John Morris was the programme editor at that time,” said Frank. 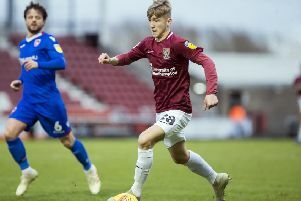 In these days of the world wide web, there is of course more information on more things than anybody could ever need, but that was far from the case for Frank when he started delving into the Cobblers history. Getting all the facts together was a long and difficult process. “I used to go to the library and look through old Chronicle & Echos, and go through the match reports,” said Frank. And Frank is still getting things together, having spent ‘six to nine months’ on the book about Bowen, which he says is set to be published in the near future. The Welshman is perhaps the key figure in the club’s long history, and he is somebody Frank clearly has a lot of love and admiration for as well. It was perhaps as a manager he made his greatest mark though, masterminding that Cobblers surge to the top flight, so in Frank’s opinion was he the best boss? “I would certainly say he is the club’s greatest manager, although the most successful one was Herbert Chapman back in the Southern League days,” he said. Frank is now set to hand over the Cobblers stats baton to his teenage grandson Ethan, who is already well versed in the history of the club. And despite Ethan’s tender years, he will also by now be well aware that watching Northampton Town is a roller-coaster ride of emotions. Frank still attends matches, sitting in the west stand with his son Dustin and Ethan, and is regularly put through the wringer, as we all were on Saturday when Town were trounced 4-0 by Colchester United. But that is of course is all part of the process of following the Cobblers. Yes it does, Frank. Yes it does.